At the Computex trade show, some manufacturers are convinced cheap, low power computers with days of battery life are the future. Alex Watson takes a look. Computer components are designed all over the world, but most are manufactured in Taiwan and China, and every year at the start of June the hardware industry heads to Taipei for the Computex trade show. Retailers are there to source new products, companies to promote new designs and reporters, analysts and entrepreneurs to look for hints of the future. Nvidia was the first big company to unveil its new products at this year's show. Best known for its graphics chips, the Californian company is focussed on its Tegra design, a "complete system on a chip" aimed at powering netbooks and even smaller internet connected computers. Tegra combines eight different processors, each one dedicated to a specific task such as HD video decoding or audio playback, packing them onto a circuit board about the size of a pack of chewing gum. Its design is focussed on keeping power consumption low. Each processor powers down when not in use. This means incredible battery life potential. Nvidia boss Jen-Hsun Huang claimed a Tegra system could play HD video for 10 hours, compared to 3 hours for a netbook powered by Intel's rival Atom CPU, and an astonishing 25 days of MP3 playback, compared to 5 hours for current netbooks. Mr Huang sketched out a bright future for the design, saying it was frugal enough with power to enable people to treat computers as they do their mobile phones - always on, connected and ready. billions of platforms. You car will turn into a computer, your TV will, your picture frame will, your clock radio will. Everything will have a computer inside it," he said. 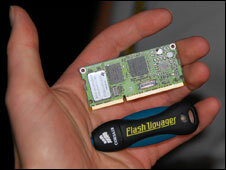 At its press conference Nvidia showed off a range of netbooks using the chip. It expects the first of these to be released before the end of 2009. Nvidia wasn't the only firm promoting low power, highly portable computers; from chips to software to physical size, everything in the category is currently being debated by manufacturers eager to guess what consumers will find most appealing. Many manufacturers showed machines based on Qualcomm's Snapdragon chip; it's equally at home in smartphones or compact computers, and may lead to a blurring of the distinction between the two. 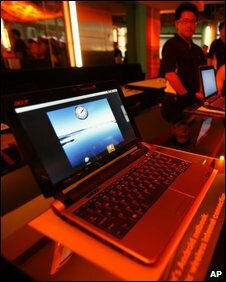 Taiwanese firm Acer had an Aspire One machine on its stand at the show that was running Google's Android operating system. While originally developed for mobile phones, Android integrates a number of free Google services such as Gmail, and could be an interesting alternative to Microsoft Windows. Asus, which created the netbook with its original EeePC (announced at Computex in 2007) showed a number of large new EeePC models, including models with touch screens which could run navigation software and be supplied with in-car mounts. While some tech firms are preaching that netbooks are hugely important for their future, others are less enthusiastic, worried that the cheap and cheerful machines will slice profit margins and result in a race to the bottom in terms of quality and design. In April, Apple boss Tim Cook said the firm wasn't interested in netbooks as they did not represent "a good consumer experience". 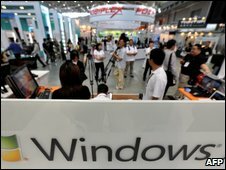 At Computex, Microsoft announced it wanted people to abandon "netbook" and use the rather less alluring "low cost small notebook PC" term instead. It is also still investigating limiting the hardware specification of netbooks that manufacturers want to ship with the cheaper Starter Edition of Windows 7. Intel also seemed keen to move the focus away from Atom, the CPU it makes and which powers most current netbooks, instead promoting its Consumer Ultra Low Voltage processor which is more powerful than Atom. AMD gave reporters a brief glimpse of its newest graphics chip, which will be able to run next-generation DirectX 11 games. DirectX is a part of Windows which helps PCs run games, and version 11, which may launch with Windows 7 (or be provided as a free update at a later point, and which will also work with Vista) will enable graphics chips to be used in much more flexible ways than just computing pixels. AMD's Richard Huddy said that "up until DirectX 10.1 a graphics programmer always had to think in terms of triangles, but [DirectX 11] changes that and allows the programmer a much freer expression of their thoughts." The chip firm was also keen to push its graphics chips' "tessellation" technology, which will also be supported by DirectX 11. As 3D graphics use tiny polygons to build models, they're prone to looking blocky in certain circumstances - such as car tyres or other round surfaces - and tessellation aims to stop this by using clever interpolation methods. It also wouldn't be Computex without some more off the wall designs. Taiwanese manufacturer Gigabyte showed off a motherboard with a Bluetooth chip that could be synced to a user's mobile phone and only allow you to see or access certain files when the phone was within range of the PC. This would be ideal for protecting sensitive data from co-workers or even, we were told with a cheeky grin by the spokesperson, adult files from spouses.